While we all know the Seattle Space Needle, Gatlinburg has it's own observation tower that boasts spectacular views of the Smoky Mountains. 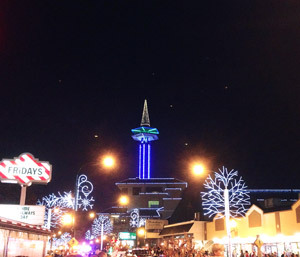 Opened in 1970, the Gatlinburg Space Needle is one of the most popular sights in the Smoky Mountains. 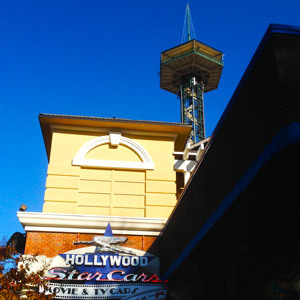 At a height of 407 feet, this tower in the middle of Gatlinburg's valley offers stunning views of the mountains. The Hurricane Simulator – Experience to the power of hurricane force winds. Lazer Runner – A laser tag game with special effects and graphics where you can compete with family and friends in a maze. The Iris Theater – This Gatlinburg theater is home to shows that feature hypnosis comedy, magic, and psychological illusions. To get to the top of the Gatlinburg Space Needle, visitors will ride up one of two glass elevators. Be warned, if you are frightened of heights, this Gatlinburg attraction may not for you. Making some visitor's fears worse, the Space Needle is designed to sway in the wind. This may be a bit unnerving when you are 400 feet off the ground, but rest assured this steel observation tower would be far less safe if it were built to be rigid in a mountain wind storm. If you brave the elevator ride and step out onto the observation platform, you'll be rewarded with views of the entire town of Gatlinburg and the high peaks of the Great Smoky Mountains. Small informational displays elaborate on what you see and share local history. Mounted binoculars are available for free on the observation deck, so you can zoom in on particular sights. Dodge the Crowds – Major events like New Years, the Gatlinburg Christmas Parade, and other crowded days in Gatlinburg can make a visit to the top less pleasant. Night Time View – Do you enjoy seeing the sparkling lights of a city? 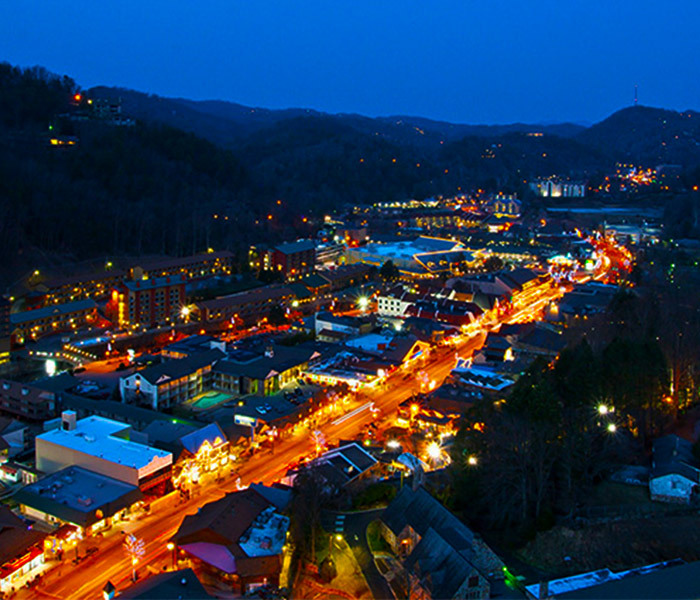 The night time view is for you when you can see the lights of Gatlinburg, Ober Ski Mountain, and far off Pigeon Forge. Day Time View – To best appreciate the panoramic views of the Smoky Mountains, it's best to visit during the day. Better yet, try watching the sunset in Gatlinburg and snapping some pictures of "the golden hour" in the Smokies. Changing Leaves – Fall can be a crowded time of year to visit the Space Needle in Gatlinburg, but you will be rewarded with panoramic views of changing leaves – simply beautiful. Winter Snow – During the winter, it's common that the high mountains in the National Park will be covered in snow. The view from the Space Needle is spectacular after a winter weather event. On Saturdays the Space Needle is open from 9 am to 2 am. The rest of the week, the Space Needle is open until 1 am, making it a hub for Gatlinburg nightlife. During the slow seasons especially, these hours are subject to change so be sure to call ahead before you visit. Insider Tip: One Ticket to the top is good for a 2nd trip within 24 hours. This gives you the chance to appreciate the view from the Space Needle at both day and night. Additionally, there are discount tickets available on the website during certain times of the year. The Gatlinburg Space Needle is a observation tower with unforgettable views of the Smoky Mountains. It's hard to find a panoramic view quite like it in the Smokies and it's an experience you won't want to miss during a vacation in Gatlinburg, Tennessee.